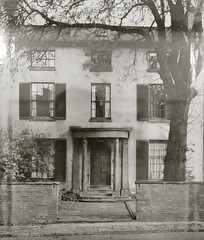 The first meeting considering the formation of the Wyggeston Lodge was held in the Masonic Hall in Halford Street, Leicester on 11th April 1910. Twenty Brethren were present and as a result of their deliberations the Lodge was consecrated on 1stJuly 1910. A total of 34 Brethren were party to the Petition to form the Lodge and with the majority of those being from Commercial Lodge, No. 1391 that Lodge became our “Mother Lodge”. The Consecration took place in the new Masonic Hall at 80 London Road, Leicester with Worshipful Brother F.W. Billson as the Founding Worshipful Master. The Meeting was chaired by the Deputy Provincial Grand Master of Leicestershire and Rutland, Worshipful Brother E. Holmes, Past Assistant Grand Director of Ceremonies of England. The Wyggeston Lodge has been privileged to meet in the Holmes Lodge Room, one of the finest in the country, since its Consecration. 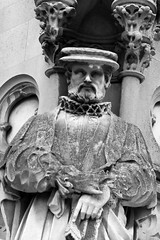 The motto of the Lodge, “Date eleemosynam et ecce omnia munda sunt vobis” which translates to “Give freely of yourselfand behold all Worlds are yours”, was that of William Wygston, the famous Leicester citizen. In common with Edwardian times the Consecration Banquet was a sumptuous affair of 10 courses at the cost of 7s.6d. (.37.5p). Various members served in the Armed Forces during the First World War and fortunately all returned without any physical injury but were no doubt scarred mentally from the horrors of that war. By 1919, the Lodge had grown from the 34 Founding Members to a total of 63. The Lodge continued to prosper during the 1920’s and ’30’s with membership standing at 110 by 1939. Not all of this increase was due to new members joining the fraternity. During this time we welcomed Joining Members from France, Scotland and Ireland and from within England from Hertfordshire, Isle of Wight, Berkshire, Kent and the West Riding of Yorkshire pointing out the universality of this world wide fraternity. An example of this universality was also evidenced in 1926 when the National Association of Headteachers held a conference in Leicester and 21 Brethren from that conference visited the Wyggeston Lodge. These visitors came from all over the United Kingdom and one from the Lodge of Harmony in Kanpur, Bengal, India. In 1925, members of the Wyggeston Lodge requested permission to form a Lodge to be known as “Knighton Lodge, No. 4711” which thus became the first “Daughter Lodge” of the Wyggeston Lodge. In 1937, the procedure was repeated with “The Lodge of Welcome, No. 5664” becoming our second “Daughter Lodge”. The activity of the Lodge was somewhat curtailed during the Second World War with meetings taking place at lunchtimes instead of the usual time in the evening. With the cessation of hostilities in 1945 matters returned to normal and in the May of that year our third “Daughter Lodge”, “Wyvern Lodge, No. 6167” was formed. One brother who was Initiated in 1948 whilst a serving member of the Royal Navy visited numerous Lodges in the Caribbean and South and North America whilst on foreign service. He eventually married a Canadian girl and settled in Canada, resigning from the Wyggeston Lodge but joining the Royal Standard Lodge, No.398 in Halifax, Nova Scotia. In the 1950’s the membership of the Lodge fell slightly but there was still a waiting time of up to two years before a candidate could be Initiated. Our Golden Anniversary in 1960 saw Worshipful Brother T.G.S. Ellwood as Worshipful Master, with the anniversary meeting being attended by 82 Brethren. Representatives from our Mother Lodge, Commercial Lodge and our three Daughter Lodges joined other visitors in a memorable evening. By 1969, candidates were still coming forward but sadly there were more Brethren dying than joining and numbers had fallen to 94. This decline has continued through the 1970’s up to the present day. Candidates were coming forward but pressures of work and the necessity to be more mobile in a work environment meant that many members were moving on to other parts of the country and although not being lost to Freemasonry were lost to the Wyggeston Lodge. The dedicated work in the Lodge by ten Brethren has been rewarded by The Grand Lodge of England appointing them to Grand Rank. Many other Brethren have served the Lodge in many capacities over a considerable number of years to the benefit of its members and with recognition from the Provincial Grand Lodge of Leicestershire and Rutland by the granting of Provincial Grand Lodge Rank. 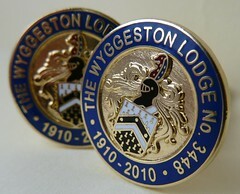 On the 1st July 2010, the Wyggeston Lodge celebrated its Centenary where Bro. R.W. Rankin presided as Master. This was attended by 169 Brethren including the Provincial Grand Master of Leicestershire and Rutland, Right Worshipful Brother D.V. Hagger, who presented a Centenary Warrant, and representatives from our Mother and Daughter Lodges. The Brethren assembled for a Festive Board, which contained a 6-course menu reflecting the original Consecration menu of 1910. In April 2011, the Wyggeston Lodge agreed to join the Universities’ Scheme to forge links between Freemasonry and University students studying at the University of Leicester. As the Lodge moves into its second century and a new millennium the Lodge motto, “Give freely of yourself and behold all Worlds are yours”, is as pertinent today as it was in 1910. © 2011-18 Wyggeston Lodge, No.3448. All rights reserved.